Welcome to the place where sleeping with the fishes isn’t a threat, it’s a privilege. After all, you’ve paid to sleep there, so you may as well enjoy it! 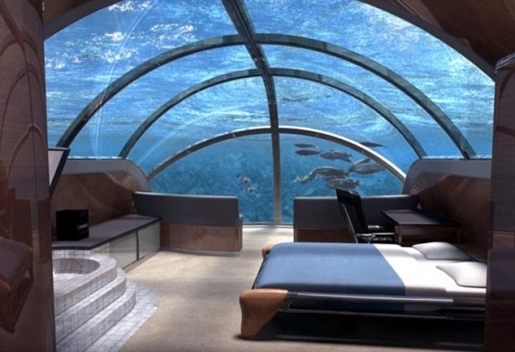 The above-pictured hotel, the Jules Undersea Lodge in Key Largo, Florida, tops the Forbes list of most remote hotels. In case you can’t tell, the hotel is not just underwater, it’s a staggering 21 feet underwater and can only be accessed via scuba diving! It’s cool and all, and I’d love to stay there, but I don’t know if it’s the world’s most remote hotel. I mean, once you learn to scuba dive, you can go there any time you want. There are other hotels on the list, like Kokopelli’s Cave in New Mexico or Winterlake Lodge, that might be even more remote. Kokopelli’s Cave is in a cave near the remote Mesa Verde National Monument in New Mexico, while Winterlake Lodge is on Alaska’s treacherous Iditarod Trail, which is one of the most difficult trails in the world. And there’s always North Korea, home of the ghost hotel, which Westerners are forbidden to travel to. I guess it all depends on your definition of remote. Either way, odds are nobody unexpected is going to be interrupting your peace and solitude. Plus, the rooms themselves are pretty sweet, even when compared to the world’s sexiest hotel rooms.